Amelia Mary Earhart (born 24 July 1897, Atchison, Kansas - missing from 2 July 1937, western Pacific ocean), daughter of Edwin and Amy Earhart, was an American aviator and noted early female pilot who mysteriously disappeared over the Pacific Ocean during a circumnavigational flight in 1937. Amelia's grandfather was Alfred Otis, a former federal judge and a leading citizen in Atchison who reportedly was not satisfied with her father Edwin's own success as a lawyer, which is said to have contributed to the break up of her family. Some biographers have speculated that this history of disapproval and doubt followed Amelia throughout her childhood as a tomboy and into her adult flying career. Amelia was twelve when her father Edwin, by then a railroad executive, was promoted and the family's finances improved. However it soon became apparent Edwin was an alcoholic. Five years later, in 1914, he was fired from The Rock Island Railroad. Amy Earhart took Amelia and Muriel to Chicago where they lived with friends. She sent the girls to private schools using money from a trust fund set up by her grandfather Alfred. Amelia graduated from Hyde Park High School in 1915, then went to Canada where she visited her sister at school. She received training as a nurse's aide and in November 1918 began work at Spadina Military Hospital in Toronto, Ontario. By 1919 Earhart had enrolled at Columbia University to study pre-med but quit a year later to be with her parents who had gotten together again in California. Later in Long Beach she and her father went to a stunt-flying exhibition and the next day she went on a ten minute flight. Earhart had her first flying lesson at Kinner Field near Long Beach. Her teacher was Anita “Neta” Snook, a pioneer female aviator. Six months later Earhart purchased a yellow Kinner Airster biplane which she named "Canary." On 22 October 1922 she flew it to an altitude of 14,000 feet, setting a women's world record. On 15 May 1923 Earhart was the sixteenth woman to be issued a pilot's license by the Federation Aeronautique Internationale (FAI). High-altitude fliers made little money. Earhart sold Canary and bought a yellow Kissel roadster which she named "the Yellow Peril." Her parents divorced in 1924 and she drove her mother across the United States in the Yellow Peril to Boston, Massachusetts where in 1925 she took employment as a social worker. 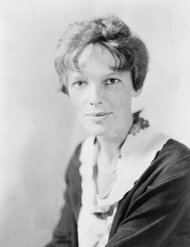 Earhart also became a member of the National Aeronautic Association's Boston chapter, through which she invested a small sum of money into airport construction and the sale of Kinner airplanes in the Boston area. She also wrote local newspaper columns on flying and as her local celebrity grew she helped market Kinner airplanes, promote flying and encourage women pilots. According to the Boston Globe she was “one of the best women pilots in the United States,” although this characterization has been somewhat disputed by aviation experts and experienced pilots in the decades since. After Charles Lindbergh's solo flight across the Atlantic in 1927, Amy Guest, a wealthy American living in London, UK, expressed interest in being the first woman to fly (or be flown) across the Atlantic Ocean. After deciding the trip was too dangerous to make herself, she offered to sponsor the project anyway, suggesting they find "another girl with the right image." While at work one afternoon in April 1928 Earhart got a phone call from a man who asked her, "Would you like to fly the Atlantic?" She interviewed with the project coordinators who included book publisher and publicist George P. Putnam and was asked to join pilot Wilmer Stultz and co-pilot/mechanic Louis Gordon on the flight, nominally as a passenger. The team left Trepassey Harbor, Newfoundland in a Fokker F7 on 17 June 1928 and arrived at Burry Port, Wales, United Kingdom approximately 21 hours later. She piloted the plane for part of the journey and wrote in the flight log, "If anyone finds that wreck, know that the non-success was caused by my getting lost in a storm for an hour." When the crew returned to the States they were greeted with a ticker-tape parade in New York and a reception by President Calvin Coolidge at the White House. Because of her physical resemblance to Lindbergh, whom the press had dubbed "Lucky Lindy", they sometimes called her "Lady Lindy." Earhart later placed third at the Cleveland Women's Air Derby (nicknamed the "Powder Puff Derby" by Will Rogers). For a while she was engaged to Samuel Chapman, an attorney from Boston. Meanwhile Putnam took the chance of heavily promoting Earhart, which included publishing a book she authored, lecture tours and using pictures of her in mass market endorsements for products including luggage, cigarettes (she didn't smoke), pajamas and women's sportswear. The extensive time they spent together led to intimacy and after substantial hesitation on her part they were married on 7 February 1931. Earhart referred to the marriage as a "partnership" with "dual control", and appears to have requested an open marriage; in a recently-discovered premarital letter to Putnam, she wrote that "I want you to understand I shall not hold you to any midaevil [sic] code of faithfulness to me nor shall I consider myself bound to you similarly.",. Later in 1931 she set a world altitude record of 18,415 feet (5613 m) in a Pitcairn PCA-2 autogyro, a forerunner of the helicopter. On the morning of 20 May 1932, at the age of thirty-four, Earhart took off from Saint John, New Brunswick with the latest (dated) copy of a local newspaper. She stopped off in Harbour Grace, Newfoundland in her single engine Lockheed Vega, intending to fly to Paris and duplicate Charles Lindbergh's solo flight. However strong north winds, icy conditions and mechanical problems forced her to land in a pasture near Londonderry, Northern Ireland, United Kingdom. As the first woman to fly solo non-stop across the Atlantic she received the Distinguished Flying Cross from Congress, the Cross of Knight of the Legion of Honor from the French Government, and the Gold Medal of the National Geographic Society from President Herbert Hoover. On 11 January 1935 Earhart became the first person to fly solo from Honolulu to Oakland, California. Later that year she soloed from Los Angeles to Mexico City and back to Newark, New Jersey. She held several transcontinental speed records. Earhart joined the faculty of Purdue University in 1935 as counselor on careers for women, exploring new fields for young women to enter after graduation. In July 1936 she took delivery of a Lockheed 10E "Electra" financed by Purdue University and started planning a round-the-world flight. This would not be the first to circle the globe, but would be the longest at 29,000 miles (47,000 km) since it would follow a grueling equatorial route. Although the Electra was publicized as a "flying laboratory" little useful science was planned and the flight seems to have been arranged around Earhart's goal to circumnavigate the earth along with providing raw material and public attention for her next book. Through contacts in the Los Angeles aviation community Fred Noonan was eventually chosen as navigator. He had vast experience in both marine (he was a licensed ship's captain) and flight navigation. Noonan had recently left Pan Am, where he established most of the company's seaplane routes across the Pacific. He hoped the resulting publicity would help him establish his own navigation school in Florida. On 17 March 1937 they flew the first leg, Oakland, California to Honolulu, Hawaii. The flight resumed three days later but a tire blew on takeoff and Earhart ground-looped the plane. Severely damaged, the aircraft had to be shipped to California for repairs and the flight was called off. The second attempt would begin at Miami, this time flying east. They departed on 1 June and after numerous stops in South America, Africa, the Indian subcontinent and Southeast Asia they arrived at Lae, New Guinea on June 29. About 22,000 miles (35,000 km) of the journey had been completed and the remaining 7,000 miles (11,000 km) would all be over the Pacific. On 2 July 1937 at midnight GMT Earhart and Noonan took off from Lae. Their intended destination was Howland Island, a flat sliver of land 2000 meters long and 500 meters wide, 10 feet (3 m) high and 2556 miles (4113 km) away. Their last positive position report and sighting were over the Nukumanu Islands, about 800 miles (1,300 km) into the flight. The U.S. Coast Guard cutter USCGC Itasca was on station at Howland, assigned to communicate with Earhart's Lockheed Electra 10E and guide her to the island once she arrived in the vicinity. Through a series of misunderstandings or errors (the details of which are still controversial), the final approach to Howland using radio navigation was never accomplished, although vocal transmissions by Earhart indicated she and Noonan believed they had reached Howland's charted position, which was incorrect by about five nautical miles (9 km), over scattered clouds which are said to have cast hundreds of island-like shadows on the ocean. After several hours of frustrating attempts at two-way communications, contact was lost, although subsequent transmissions from the downed Electra may have been received by operators across the Pacific. The United States government spent $4 million looking for Earhart. The air and sea search by the Navy and Coast Guard was the most costly and intensive in history at that time, but search and rescue techniques during that era were rudimentary and planning was influenced by individuals wary about how their roles in looking for an American hero might be reported by the press. Many researchers believe the plane ran out of fuel and Earhart and Noonan ditched at sea. However, one group (TIGHAR - The International Group for Historic Aircraft Recovery) suggests they may have flown for two and a half hours along a standard line of position, which Earhart specified in her last transmission received at Howland, to Nikumaroro (then known as Gardner) Island in what is now Kiribati, landed there, and ultimately perished. TIGHAR's research has produced a range of documented, archaeological and anecdotal evidence (but no proof) supporting this theory. Amelia Earhart was a widely-known celebrity during her lifetime. Her shyly charismatic appeal, independence, persistence, coolness under pressure, courage and goal-oriented career along with the mysterious circumstances of her disappearance have driven her lasting fame in popular culture. Hundreds of books have been written about her life, which is often cited as a motivational tale, especially for girls. Earhart is generally regarded as a feminist icon who blazed a trail of achievement for generations of women who came after her. 20 Hrs., 40 Min. was her journal of her 1928 flight across the Atlantic as a passenger (making her the first woman to make such a journey). The Fun of It was a memoir of her flying experiences, as well as an essay on women in aviation. A third book credited to Earhart, Last Flight, was published following her disappearance and featured journal entries she made in the weeks prior to her final departure from New Guinea. Compiled by Putnam himself, historians have cast doubt upon how much of the book was actually Earhart's original work and how much had been embellished by Putnam. During the decades since her disappearance many rumours and urban legends have circulated (and often been published) about what might have happened to Earhart and Noonan. Some have claimed Earhart was captured in the South Pacific Mandate area by the Japanese and interned for a number of years before either perishing or being executed. Purported photographs of Earhart during her captivity have been identified as having been taken before her final flight. A fictional World War II era movie called Flight for Freedom starring Rosalind Russell and Fred MacMurray is often cited as the most likely source of a popular myth Earhart was a spy. Some researchers have noted the possibility that for wartime propaganda purposes, the US government may have tacitly encouraged (or was indifferent to) false rumours Earhart had been captured by the Japanese. An archaeological dig on Tinian in 2004 failed to turn up any bones at a location rumoured since the close of World War II to be the aviators' grave.